It is believed the Egyptian Mau is descended from the African Wild cat due to their remarkably similar appearance. The African Wild Cats were known to have lived in the same region where the Mau first appeared. No matter how they came about, once this breed was domesticated it became indispensable. The Egyptian Mau first arrived in the United States in 1956. Russian expatriate Princess Natalie Troubetskoy emigrated from Italy where she had bred a smoke male belonging to the Egyptian Ambassador to Italy with a silver female from Cairo, producing a silver kitten named Baba. Baba was then mated back to her father and two kittens by the name of Joseph (nicknamed JoJo) and Jude were born. Jude died but JoJo was mated back to his mother, producing a female kitten by the name of Liza. These three Mau’s were brought to the United States by Princess Natalie and were to become the founding stock of the Egyptian Mau in the United States. The CFA recognised the Egyptian Mau in 1977. The word Mau means cat in Egyptian. The Egyptian Mau is an elegant beauty that graced Ancient Egyptian art as early as 2200 B.C. These cats were seen as both loving companions and valuable protectors throughout the Ancient Egyptian timeline. Egyptian Maus were originally trained to hunt prey, such as birds and fish, and return the bounty to their humans. They were also taught to guard crops by keeping away small animals that would disturb them. Cats were held in such high regard that if anyone was to be caught killing a cat in this period, they would be immediately stoned to death for their crime. The Egyptian Mau is a small to medium-sized cat. He is muscular, with hind legs longer than the front legs. The coat is silky with a fine texture. The forehead has a dark M shape, and mascara lines which run from the cheeks and down the neck. The ears are large, and the almond-shaped eyes are gooseberry green. The coat lies flat against the body and has a glossy sheen. The dark spots stand out against a lighter background. 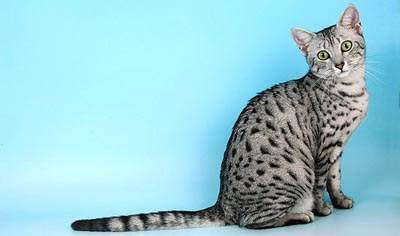 The Egyptian Mau is the only naturally occurring domestic breed of cat with spots. 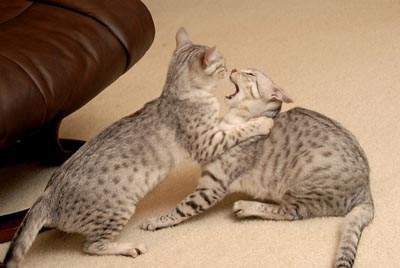 Other spotted cats include the Bengal and Ocicat, however, these two breeds are man-made. 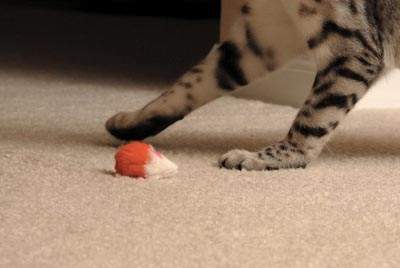 The Egyptian Mau is an intelligent, outgoing, playful, lively and active cat. They thrive on attention and do not like to be left on their own for extended periods. This is a breed who bonds deeply with their human family and gets on with pets and children. They are athletic and love to climb. The Egyptian Mau is the fastest domestic cat breed. Egyptian Maus are talkative, but this is not their only method of communication, they are fond of wagging their tail when they are happy. 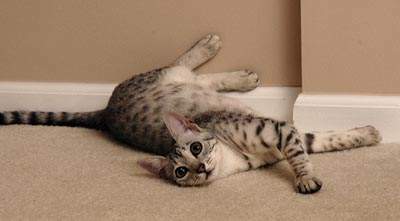 The Egyptian Mau is a healthy breed with no known health problems. Purebred cats should be purchased from a registered cat breeder. They should be able to provide you with the cat council they are a member of. Where possible, visit the cattery to view the kitten and its parents as well as the environment the cats are raised in. It should be clean and well cared for. Ask the breeder about health guarantees and any genetic testing that has been carried out on the parents and/or the kittens. Decide if you want a pet or show quality kitten and let the breeder know your preferences. A show quality kitten is a good example of the breed, a pet quality kitten may have a minor fault which has no health impact on the kitten, it just means it would not fare as well on the show bench. Pet kittens cost less than show quality kittens. Most breeders will desex (spay or neuter) kittens before they go to their new home. This is to prevent cats being bred with by backyard breeders or cats in pet homes. It also saves the new owner time and money as most breeders are able to obtain a discount from their own veterinarian. Australian breeders must microchip cats before they go to their new home. This is a permanent form of identification. Never hand over cash without a receipt. There are a lot of scammers out there. When viewing kittens, they should be lively, friendly and in good health with clear eyes and no discharge. 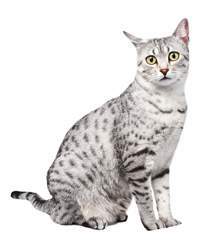 The Egyptian Mau is easy to care for. A five minute brush once a week will remove loose hairs from the coat. All cats need proper dental care to prevent the build up of tartar on the teeth. Brush daily with a pet toothbrush and toothpaste and/or feed raw chicken necks or chunks of steak two to three times a week. Keep your cat indoors or provide a safe outdoor cat enclosure to prevent roaming, fights with other cats and hunting wildlife. Trim the claws every 4-6 weeks.